The Casian Kings food truck nestled in the barn-like structure of The Truck Yard in Houston. Photo by Tuan Tran. 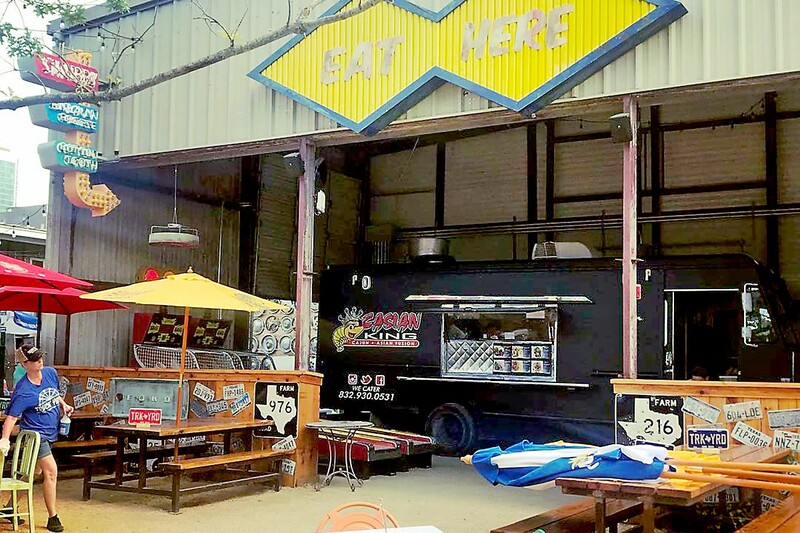 The Truck Yard is located at 2118 Lamar in Houston’s burgeoning EaDo district and is a combination beer garden, live music venue and funky art exhibit. (The original opened in 2013 in Dallas.) A restaurant inside a barn-like structure serves cheesesteaks, beer and cocktails. From the day it opened until August 24, two or three food trucks parked inside the barn sold other types of food alongside the restaurant. Truck owners and patrons alike benefitted from the complementary arrangement, which included places for customers to sit down and eat and bathroom access. That ended when the Houston health department showed up and told The Truck Yard and food truck owners that they all had to shut down immediately. This happened just over four months after The Truck Yard made its debut in Houston. Before that, its plans had been reviewed and approved by various departments with the city, including the health, fire, and planning and zoning departments. It’s lunch time Truck Buddies! So come park it at Truck Yard and grab some fuel! “It’s somewhat frustrating as a truck owner when the ordinances aren’t consistently enforced. I don’t always know when it’s ok and when it isn’t ok to operate,” Hulse said. Packard referenced the City of Houston’s ordinance that regulates food trucks and other “mobile food units.” The relevant section called “operation capacity limited” which stipulates that “operators cannot attach, set up or use any device or equipment intended to increase selling, serving, storage or display capacity of a mobile food unit.” In other words, mobile food units can’t have any canopy, awning or other covering that isn’t attached to the truck. The Truck Yard in Dallas, which clearly doesn’t have a problem providing seating near food trucks thanks to less-restrictive city ordinances. Photo by Ryan Landis. However, the section of the ordinance does state that coverings provided by others and primarily used for other purposes and only incidentally used by a mobile food unit isn’t considered a violation. The “100-foot rule” that Packard referenced is also within this section and specifies that tables and chairs can’t be within 100 feet of a mobile food unit. Other populous Texas cities, such as Austin, Dallas and San Antonio, do not have a similar law. There have been multiple attempts to amend the code of ordinance section for mobile food units over the years, with little success to date. In 2010, the Houston Press reported about Save Our Food Trucks, an organization that was attempting to change the regulations. Two years later, the Houston Press reported that the organization had changed its name to Mobile Food Unit Houston and had been working diligently since 2010 to amend the city codes. These days, its website is abandoned and populated by random clickbait content. 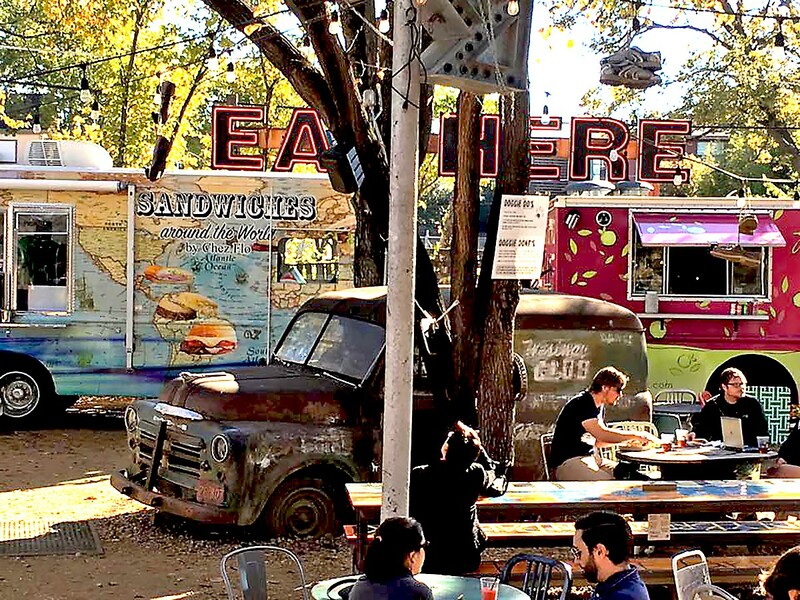 In 2014, food truck owners finally had a victory when then mayor Annise Parker passed an executive order authorizing trucks to do business in downtown and the medical center, thereby lifting a long-held ban on the trucks in those areas of town. (The ban was due to concerns about the trucks’ propane tanks needed to fuel stoves and other cooking appliances.) Many food truck operators were hopeful that this wave of administrative support would lead to relaxing other bans, such as the one on seating, but so far this has not happened. City councilman Robert Gallegos represents the district where the Truck Yard is located so Houston Food Finder contacted his office for clarification of the ordinance regarding tables and chairs. He in turn emailed the city’s legal department and asked for clarification of the issue. Gallegos’s chief of staff, Daniel Santamaria, shared the response with Houston Food Finder. The email states the exemption “only applies to smaller mobile food units.” In other words, fixed-location mobile food units, such as mall or lobby kiosks, can be within 100 feet of tables and chairs that are provided by a third party but larger, unrestricted mobile food units, i.e. food trucks, must adhere to the 100-foot rule. Food truck fans, owners and employees interested in changing the law to provide seating, shade and nearby bathrooms for patrons are going to have to continue making efforts to get their voices heard. Otherwise, change is unlikely. “What we tell any constituent, group, or industry that has a concern is we invite them to come on a Tuesday at 2 o’clock during public session in front of the entire city council and the mayor and propose their solutions,” said Santamaria. Anyone who wants to be placed on the agenda can call the city secretary and request a slot. Speakers are given one to three minutes in front of the council, and it’s helpful to know the name of your district representative to address them directly. Without a new grassroots effort, food truck owners are going to have to continue to fining random bars, breweries and other host establishments to park at, and patrons get to continue dining on their feet. What’s the point of the 100-foot rule? And seriously, who came up with this definition of what a “building” is that it includes this kind of structure?